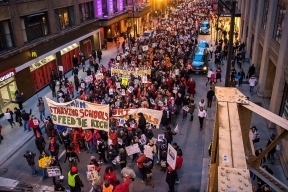 The Chicago Teachers Union is planning a massive April 1st walkout with thousands holding picket lines in the north and south side communities, culminating in a rally just outside the Thompson Center. Also joining CTU is the Fight for $15 organization to demand for $15/hour and union rights from fast food corporations. Standing together with the striking teachers, CPS parents and students, nursing home and airport workers to vocalize communities hit hardest by inadequate funding. Earlier this month, the Chicago Teachers Union voted in favor of a one-day teacher walkout on April 1st in an effort to push Governor Bruce Rauner and state lawmakers to provide a new funding plan for the district. For up to date coverage on April 1 Day of Action, visit www.lawndalenews.com.